Confessions of a Book Addict: Blog Tour: Jane and the Waterloo Map and a Grand Giveaway! 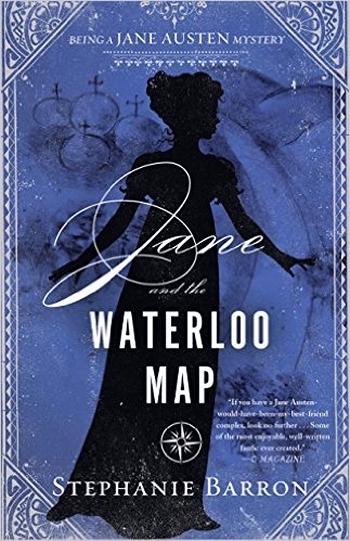 Blog Tour: Jane and the Waterloo Map and a Grand Giveaway! I am very excited to be a part of the Jane and the Waterloo Map Blog Tour today. Amateur sleuth Jane Austen returns in Jane and the Waterloo Map, the thirteenth novel in Stephanie Barron’s delightful Regency-era mystery series. 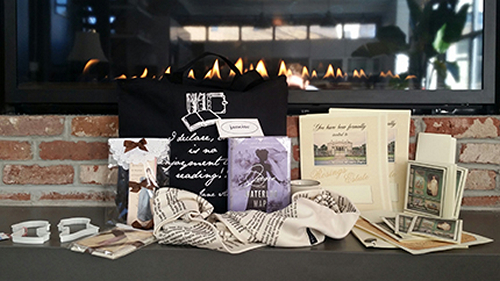 A fabulous giveaway contest, including copies of Ms. Barron’s book and other Jane Austen-themed items, will be open to those who join the festivities. Today I am sharing an excerpt from the novel. I love all things Jane Austen, so I can't wait to check this book out. EXCERPT FROM CHAPTER 5: In which Jane walks into Town from Knightsbridge, and discovers an acquaintance at Hatchard’s Book Shop. "I wasted an hour over my needlework in Henry’s parlour, in dutiful expectation of a messenger bearing typeset pages of Emma from Mr. Murray’s establishment. None appeared. As it must be impossible to publish a novel that has not been proofed by the authoress, and as one cannot proof what is never delivered, I suffered extremes of vexation. I intend to quit London for my home in Hampshire in early December, and it seems unlikely that the printer’s work—which I had hoped would be finished—will be even half done. I set aside my needle and wools, and determined to walk out in the watery sunshine. I was desperate for intelligence of the sort only London could provide. I collected a cloak and my reticule, adjusted my serviceable bonnet in the looking glass, and drew on my warmest gloves. It is no small matter to walk into London from Hans Place, and I meant to go as far as Hatchard’s Book Shop in Piccadilly. It is less than a mile from Henry’s house to the little village of Knightsbridge, with its cavalry barracks and inns, its watchhouse and pens for straying livestock. Not quite the bustle of Town, but not entirely rural, either—London continues to encroach on the fields all about. A fine square is being laid out, and is to be called Cadogan Place, with a terrace of houses to rival Bath’s Royal Crescent along one side. I hurried a little as I walked up Sloane Street, anxious that I should not encounter our neighbour from Hans Place, Mrs. Tilson. She is the wife of Henry’s partner, James Tilson, and the mother of a numerous family; a rather tiresome creature in her Evangelical fervour—and unlikely to approve of a gentlewoman on errands abroad without her maid. I had torn Manon from Henry’s care yesterday, however, in undertaking to visit Carlton House; and I did not wish to deprive my brother of his cosseter this morning as well. The opinions of a Mrs. Tilson must be as nothing to me. That my sister Cassandra should probably have shared them, I did not allow myself to acknowledge. There was little to remark, of course, in a stroll to Knightsbridge—but the evils of taverns and militiamen from thence to Hyde Park Gate could not be ignored. I trusted to my advancing age to preserve me from insult. Knightsbridge was charming at this hour of the morning—a little before noon--with a single forlorn cow lowing despondently in the village enclosure. The smell of warm bread drifted from a baker’s oven. I turned right along the Brompton Road, my head down to avoid any impertinent or roving eyes; but none were abroad today, and a quarter-hour’s brisk effort brought me safely to Hyde Park tollgate, sitting atop its rise, with a weighing house to one side and a watch house on the other. I nearly bounded up the gravel incline—being by then thoroughly warm and contented, flushed with exercise. Passing through the gate, I was treated to the usual lively London scene: Gentlemen swaggering around Grosvenor Square en route to Tattersall’s, where the most beautiful and spirited horseflesh is at auction; poor souls hastening into St. George’s Hospital to visit the sick; and all of Piccadilly, with its crush of carriages and mounted horsemen, stretching in a mud-churned expanse before one’s feet. Hatchard’s Book Shop sits on the right-hand side of Piccadilly, at No. 187, just beyond the lengthy enclosure of Green Park; and it being the finest establishment of its kind in England, a veritable Heaven for any lover of books, I was frequently unequal to the temptation to browse among its wares. In truth, I visited it nearly every day that weather permitted. I was not yet so far sunk in depravity as to actually purchase many volumes, being a firm friend of the Circulating Library; but I dearly loved to caress the boards of fresh publications, feel the weight of their paper and the elegance of their type, and I frequently consulted the newspapers Hatchard’s so obligingly made available to the publick for a trifling fee. After a buffeting and determined journey along the paving—the crowds of London never cease to amaze—I achieved Hatchard’s. I opened the shop door and made my way through the displays—glorious scent of ink and new leather!—to the pleasant room beyond, where easy chairs and tables were set about the racks holding the latest editions of London papers. I did not trifle with the weekly journals, or the Sunday Observer; The Morning Chronicle and The Morning Post were my objects, as they were every other person’s in the room, save for a gentleman engrossed in a sporting journal and a pair of young ladies turning over the leaves of La Belle Assemblée. I observed the latter to be whispering over the plate of an impossibly tall nymph in swansdown, with rubies to her headdress. They had no notion, of course, what such a costume cost—and if the men in their lives were suitably up to snuff, should never be required to know. Ladies who ordered their clothes for themselves were wiser and thriftier, however. A copy of the Chronicle slid across the polished reading table, discarded. I snatched it up. The paper was of a notably Whiggish turn. In the past this might have meant a protective tone regarding the Prince and his Set; but of late His Royal Highness had forgot his old friends in the Opposition, and had embraced the current Tory Government as preservers of Royalty, and thus more likely to pay his bills. I searched the columns with a swift eye. It would be a brief notice, in the section reserved for departures, arrivals, births, engagements and deaths. Not to mention scandals. Elopements did a brisk trade in the Morning Chronicle, while rumours of indecency of every kind were vaguely suggested with elisions and initials. I turned, startled, but the question was not directed to me. A gentleman stood by the clerk’s counter, and as he leaned forward in expectation of his answer, I knew his profile: high forehead, blade of a nose, the eyes deeply set. My heart beat erratically and I almost fled Hatchard’s—but Mr. Raphael West stood between me and the safety of Piccadilly. He bowed. His countenance had flushed to the roots of his dark hair. He did not meet me with indifference, then. Or was this merely embarrassment at being discovered in the solicitation of a novel? He had not disguised his appreciation for my pen when we first scraped acquaintance, last Christmas at The Vyne." Wow! I love the sound of this! To learn more about the book, check out the description below along with links to buy the book. I agree...the perfect combination, Angela! Thanks for visiting! What a great excerpt. I laughed, too, at the idea of a cow in the village enclosure of Knightsbridge village. A cow in Knightsbridge today would really be something to stare at. Haha. Agreed! I'm glad you enjoyed the excerpt. Thanks for visiting, Linda! I love the part when he asked if any more books was coming after Mansfield Park. This is so fun! I'm so glad I discovered this series and your blog, I can't wait to binge read the whole series! Thanks for visiting my blog and I hope you enjoy the series, Bethany. Interesting excerpt. I wonder what she was searching for in the paper. I can't wait to read this! The rule for excerpts is...NO SPOILERS. Otherwise I'd be happy to tell all. Enjoy! Thanks for visiting, Stephanie! I can't wait to read your book. FANTASTIC EXCERPT! I am so excited to have discovered this series! Thank you for the giveaway! Thanks for visiting, Caryl. I hope you enjoy the book! Ooh, she sounded just like Elizabeth Bennet when she made her presence known to Mr. West! Good excerpt! Great connection, Summer! I agree. Thanks for visiting! Wow! Great excerpt! Now we have to wait to read to find out! I'm glad you enjoyed it. Thanks for dropping by. This is a wonderful series, have enjoyed every book. These excerpts have me wanting more, can't wait to read it. I am glad to hear you are a fan of the series. I look forward to checking it out. Thanks for visiting, Seth. Loved the Fast Frigate with Precious Cargo. A very "Jane" approach to the news! I am 31 on the list for my Circulating Library....patience. Oh no! You'll definitely need patience. Thanks for dropping by, J.C. I've been enjoying all the excerpts, getting excited for the new book. Thanks for the chance to win! I'm glad you are looking forward to reading the book! Thanks for visiting, Holden! I agree, Kim. Thanks for dropping by! The excerpts are great! Interested to read this book. I agree, Betty. I'm glad you like the sound of this book. Thanks for visiting! I'm so glad to hear you are a fan! Thanks for visiting! Really puts you into the geography of the place! I love it. I'm glad you enjoyed the excerpt! Thanks for visiting, Alisha. This book tour has been a delightful mix of reviews, excerpts, history and most of all, fun! I'm glad you are enjoying the book tour, Debra. Thanks for dropping by! So happy that there is a new book in this series. It is on my TBR list. Thanks for the opportunity to win such a great prize. Absolutely! I'm glad you are looking forward to reading it. Thanks for visiting, Raquel. Awesome. :) Thanks for the excerpt. My poor husband sat through two versions of Sense and Sensibility and then the same of Pride and Prejudice. Fortunately, he is almost as much of a Jane enthusiast as I am. Thanks for doing this! I have some of these books and also enjoy other Austenesque books with P&P characters, etc. I really need to get this book! I love the cover. The colors and fonts are great. I do judge a book by its cover first and I give this one an A+.